Experience the hilariousness brought forth by this simple yet sophisticated mod that lets you toggle the mod on and off through a simple shortcut on your desktop. This mod gives all cars, except a selected few mentioned in the readme file, negative base friction on their wheels, making them accelerate, rather than decelerate, at all times when the wheels are in contact with a surface, whether it be the ground, a wall or the ceiling. This makes for a lot of hilarious car madness, without a doubt. This mod has absolutely nothing to do with the Carmageddon game from 1997, Stainless Games, the Carmageddon series nor the movie Death Race 2000, which Carmageddon from 1997 takes inspiration from. Thanks for the continued support of my fellow GTAIV fans. The proper version 3 of the Carmageddon Mod is now finished, now complete with a proper uninstaller and a script that resets your GTAIV and/or EFLC back to how they were upon uninstallation of the mod. Ladies and gentlemen, I present to you, the all-new Carmageddon Mod. 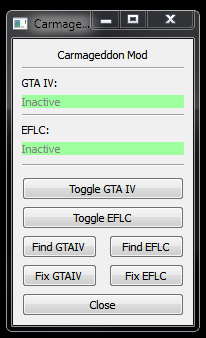 Upon first startup of the program, you'll be g reeted by a prompt asking you to specify where your GTAIV and EFLC installations are located on your computer. Note that this directory prompt is much more user-friendly and prettier to look at in general (in conjunction to being rather familiar to some users as it's an extremely widely used layout for prompts). After specifying the game folders, you are left with a petite window with little explanation of what each button does, until you hover your mouse over them. Each button has a nifty tooltip that pops up when you hover your mouse over the button, informing you of its function and what you can expect once you click it. Utilizing a graphical UI instead of the old text boxes from version 2.x has indeed increased the mod's actual size quite a bit. Even so, I've stripped down a lot of things accidentally included in the installation that were never being used, which brings the new file size to 33,6 Mb after installation. The uninstall script, which is new to this version of Carmageddon Mod 3, allows the user to uninstall Carmageddon Mod, should he/she so wish, regardless whether Carmageddon Mod's active at the moment (Carmageddon's handling.dat active, instead of the normal handling.dat) or not, removing the Carmageddon'd handling.dat from your computer along with the folders used for swapping out the files in question. This ensures a clean slate upon removal of the mod. Error messages like "Could not find GTAIV's handling.dat file" and "Permission Denied" errors are a thing of the past as far as I can tell (at least the former of the two). I still need feedback from you, the user, whether this is a problem for you or not. I am one man with one computer; I cannot produce every possible machine setup myself. If you encounter an error while using Carmageddon Mod, simply mail me the log.log file that is located in your Carmageddon Mod's directory. If you encounter any strange behavior while using the mod and want to know what's happening, open the log.log file in a simple text editor, like notepad, and see for yourself. 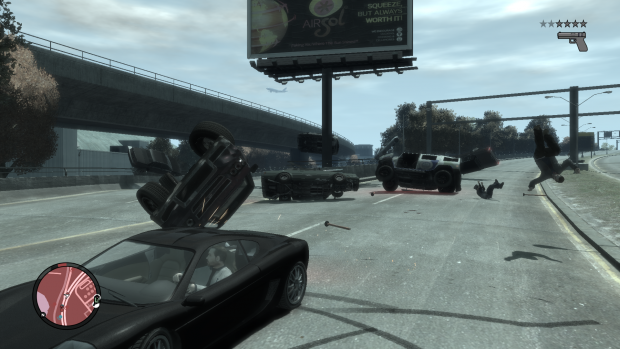 Most events that happens under the hood of Carmageddon Mod is recorded there. I have extensively tested it for bugs, but I am merely one man, and will possibly have missed something along the way. I hope you will have as much use of this utility as I had once I initially made it back in 2010. I saw the Carmageddon tweak (in lack of a better term) on YouTube, and immediately realized that that was something I wanted to try out, but I couldn't find a proper mod for it, only instructions on how to do it. So, I created a switcher, which allows you to switch between the Carmageddonified handling.dat and the normal handling.dat in your copy of GTAIV and/or EFLC, to easier let you play like normal as well. Thank you very much for your support, my fellow GTAIV-fans. 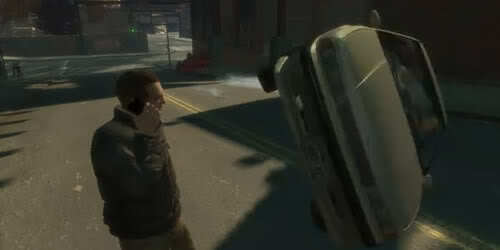 Let's hope GTAV uses the same old handling.dat system as all 3D GTA's have. after i choose gtaiv location it still says prompting for the path of gtaiv?